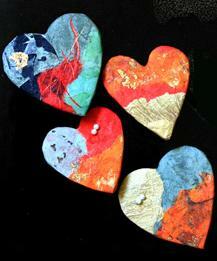 Our Northern CA Head, Kuni Migimatsu, has been making these heart-shaped pins since he was 6 years old. He covers a cardboard base with mostly Japanese papers, and puts on beads or gold leaf for a little touch. His pins were sold out at art shows in Sausalito each time. If you are interested in Kuni's pins, please contact us at childreninneedclub@gmail.com. Thank you!